Cash is also a Position. Traders need to Survive Corrections. The last 2 weeks have been one of the worst periods for Sensex in terms of the magnitude of the fall as well as the time period. The rise from 19074 to 20665 took 15-16 sessions but the whole has been removed in less then 10 sessions which is one of the most negative signals. A faster retracement of such sorts indicates a possible trend change. So as a precaution would be maintaining the high cash till the market gives a sure turnaround above 19600. One may look to do some bottom fishing at 18000/18500. As the long term trend changes only below 17800. As i have mentioned many a times in my articles Cash is also a Position so if one is in doubt or not comfortable they can keep a good amount of cash so opportunities which arise in panics can be grabbed. In the near term RSI has gone to 30 levels and is reaching highly oversold levels. Any drop beyond 18500 in the week needs a reason which could be some announcement as ever since Jan 2008 we have not seen such oversold condtions. Short Term Channel shown in green comes at 18500 as well as previous breakout was at 18500. Similar levels for Nifty comes to 5550. The longer term channel which got resisted on the upside many times comes to around 18000-18200 and will keep rising as the time goes. 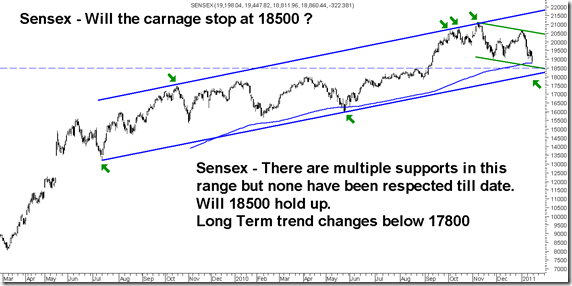 A medium to long term trend change happens if index closes below 18800 on weekly monthly basis or breaks below 17800. 200 dema at 18800 is one support but is not always respected. Also sustaining below 19000 makes the momentum go away and we could expect a sideways consolidation. A better call can be taken on markets after the next two weeks where i would prefer to watch with cash in hand although one may go wrong but if you are not in the market all you can lose is an opportunity but forcing yourself to stay can make you lose heavily. On time cycle basis expect some turnaround from Wednesday as we have not seen clear drops for 10-13 sessions in this manner. Reliance 960-980 , ICICI Bank 980-1000, SBI 2450 , LnT 1650-1700 are support levels which need to be respected by the market over the next few weeks to keep the hopes of bounce alives. Bottomline – At times its good to watch the market. So for the next two weeks would prefer to watch the market closely. Sir, I agree fully with your view of BEING ON CASH is also a trading/investing decision. Although this adversely effects my revenues as a subbroker, I have asked my clients to wait and watch before delivary picking. Yes will need to wait for a confirmation. But this is going to be tested over time.Long term target remains at 22500 till it doesnt close below 17800/18500 on long term charts. So its a timewise issue. Yes doji is a good sign and divergences too. We may wait for 3-4 sessions. No one likes a bear market 🙂 so let us wait for 19580 to be crossed and sustained or some consolidation in this range. Not closing below 18800 for a few sessions is positive. 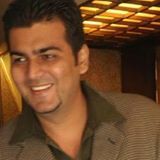 Can U please give 3 strategies to beat inflation in India ? Your views on SCI ? Its at bottom and could slip further as it has broken the MAs.. Is it a good buy to accumulate with every fall. Horizon – 1yr atleast.